Note : Please arrange the Flight at 07.30 AM from Bali or if you stay at Labuan Bajo, need to be ready at 08.00 AM at the Hotel Lobby. The Komodo Explore 2D/1N start Labuan Bajo is a suitable Komodo tour package for a short holiday planning. We arrange a simple package which allows you to see more beautiful destinations and activity on Komodo National Park. Our classic wooden boat offers a comfortable sailing for a great Komodo adventure. It is leaving every day from the beautiful small town, Labuan Bajo. Our selected destination such as Rinca island, Pink Beach, and Komodo island is the most visited island for most world travelers. The 2 days and 1 night Komodo island tour is a complete liveaboard tour package to Komodo island. A private cozy boat will let you explore more the National Park. The boat provides a cozy bedroom with Air-condition and can accommodate 6 people at maximum. The boat offers an International standard safety. Pick up at Air Port or your hotel in Labuan Bajo. And then drive to Labuan Bajo harbor for the boat trip. First to visit is Rinca Island. On Rinca island, you will hike for two hours to see the dragons and other wildlife. Next to visit is Pink Beach. Here you will have a relaxing, sunbathing, snorkeling, swimming, and pictures. After that visit Kalong Island. On Kalong island you will have sunset and watching the bats flying over the island. And then overnight on the boat. Early in the morning, you will leave Kalong island, breakfast will serve on the boat. 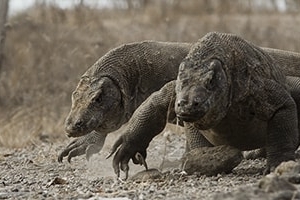 First to visit is Komodo Island. What you expect to do and see here are hiking, pictures, see Komodo Dragons and other wildlife. After that you will visit Manta Point, here you can swim and snorkel. Next to visit is Bidadari Island. What to do here are snorkeling, sunbathing or just relax on the beautiful white sandy beaches. And then back to Labuan Bajo, drop to Airport or your hotel.